Published on August 30, 2016 August 21, 2016 by Rachelle J. Doctor Who: Time Lord Fairy Tales read by Tom Baker, Paul McGann, Joanna Page, Michelle Gomez, Adjoa Andoh, Ingrid Oliver, Anne Reid, Dan Starkey, Sophie Aldred, Rachael Stirling, Samuel Anderson, Nicholas Briggs, Pippa Bennett-Warner, Yasmin Paige & Andrew Brooke. I had an Audible credit and no idea what I wanted to listen to next. I had already gone through my wishlist and didn’t find any of the samples of the audiobook editions appealing. I also knew I wanted something in the Sci-Fi genre, but no idea what, so I did a search to see what Doctor Who books were available. Most of them were far lower in price than what I paid for the credit, but then I saw Doctor Who: Time Lord Fairy Tales and that Michelle Gomez, the actor who plays Missy, was one of the narrators. The sample sounded wonderful, and really, what could be better than uniting Doctor Who and classic fairy tales? I don’t think I could have made a better choice than to use my credit to purchase this gem of an audiobook. I loved every minute of every story. I wasn’t always sure what fairy tale a story was based on, but that didn’t matter to me, because they all had the feel and sound of a fairy tale, and that was exactly what I wanted. The first is a wonderfully creepy tale involving the Angels, and while it felt familiar to me, I couldn’t quite place its origin in the fairy tale canon. However, most of the other stories were immediately obvious, even if you’re not paying attention to the titles, including one that was an interesting version of Sleeping Beauty and another equally interesting version of Hansel and Gretel. There are also versions of Cinderella (which is one of my absolute favorites), Jack and the Beanstalk, Snow White, Red Riding Hood, Beauty and the Beast, and several other well-known stories. 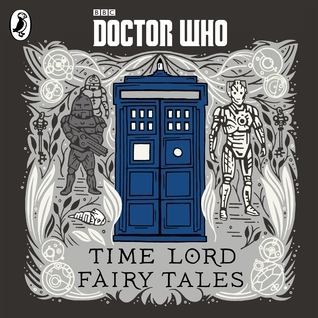 Normally, I’m not one to re-listen to an audiobook, but I think Doctor Who: Time Lord Fairy Tales might be the exception. I also want to add the hardcover edition, which is supposedly beautifully illustrated like a children’s storybook, to my collection. This is definitely one of the books every Doctor Who fan should have. Oh, this sounds fabulous! I’m a Doctor Who fan too. 🙂 I just checked and can see that my library has this, so I’ll be checking it out myself.